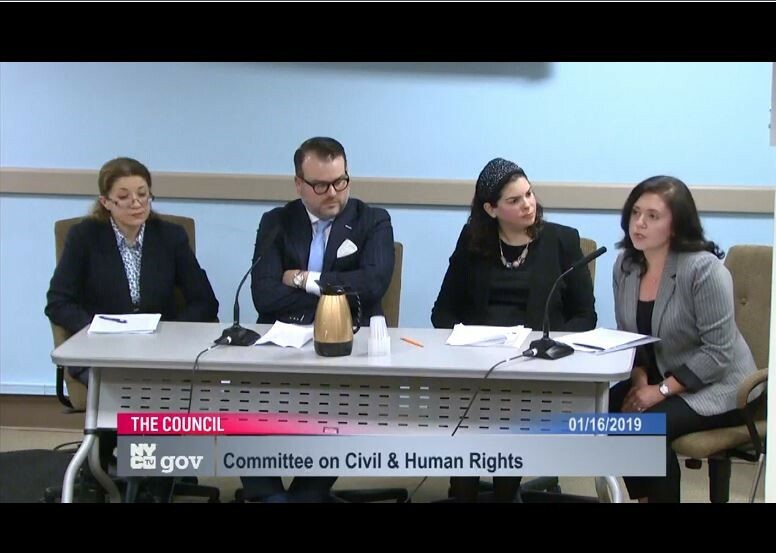 Today, the New York City Council’s Committee on Civil and Human Rights met to vote on a resolution to recognize January 27, 2019 as Holocaust Remembrance Day and the week beginning on January 27, 2019 as a citywide week of Holocaust Education in New York City. Citing the nearly 45,000 Holocaust survivors living in New York City, this legislation—characterized as “a statement in favor of humanity”—passed unanimously, with several sponsors of the resolution speaking movingly about what it meant to them as New Yorkers, as educators, as members of minority groups, and as witnesses to history. After the vote was taken, members of the community added their voices of support. These voices included several Holocaust survivors, as well as Rita Iosefson, Deputy Chief of Staff at the Museum of Jewish Heritage—A Living Memorial to the Holocaust. The video of the meeting is available here (choose the ‘Meeting Video’ link). Rita’s testimony begins at 1:19:38. The Museum has a series of commemoration events for International Holocaust Remembrance Day scheduled from January 27 through February 3.